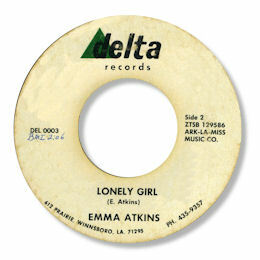 Like the Jo Jo Coleman on the same label, this 45 by Emma Atkins never made it out of rural Louisiana. But that doesn't stop us appreciating a fine vocalist on a strong southern soul tune. There's some lovely bluesy guitar flourishes throughout this tale of woe, and a wailing tenor sax, both of which make a fine backdrop to Ms Atkins as she half-talks and half-sings her own lyric on Lonely Girl. As with the Jo Jo 45 production values and the musicianship are of a high order for such a tiny outfit as Delta must have been.